Kick off the semester with food, drinks, and conversation in a relaxed and friendly atmosphere! 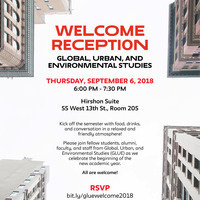 Please join fellow students, alumni, faculty, and staff from the Global, Urban, and Environmental Studies (GLUE) programs as we celebrate the beginning of the new academic year. All are welcome! Please RSVP. Sponsored by The New School's interdisciplinary programs in Global Studies, Urban Studies, and Environmental Studies.